The Oskar Klein Centre (OKC), named for the late outstanding theoretical physicist from Stockholm University, combines particle physicists, cosmologists, and astrophysicists from the Departments of Physics and Astronomy at Stockholm University and the Department of Physics at the Royal Institute of Technology. 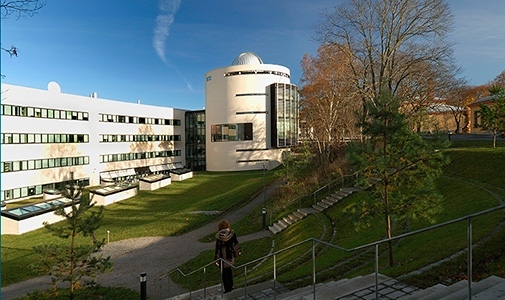 The Centre was created due to a unique 10-year Linnaeus grant from the Swedish Research Council in 2008. Currently the OKC comprises more than 140 scientists who are organized into four working groups in order to tackle some of the Universe's most exciting and mysterious problems. The presence of dark matter is inferred from its gravitational effects on, for example, the motions of stars inside galaxies and galaxies in clusters, and gravitational lensing. Members of the OKC seek to detect the particles that constitute dark matter, with a particular focus on Weakly Interacting Massive Particles (WIMPs) and axions or axion-like particles. OKC experimentalists are focusing on both direct and indirect dark matter detection methods while OKC theorists are engaged in phenomenological interpretations of possible dark matter signals and theoretical predictions from models. What is the structure and fate of our Universe? How do galaxies form and evolve? A comprehensive picture of our Universe requires that it be examined and understood on both large and small scales. On large scales, OKC researchers who study the cosmic microwave background and the large-scale distribution of galaxies are working out the properties of the cosmological model. On small scales, OKC members investigate star formation in galaxies and the structure of the interstellar medium. Understanding the behaviour and properties of extreme objects, in particular supernovae, neutron stars, and black holes. These events and objects are the end-result of the star formation process and are studied at the OKC both for their own sake and for their application to other outstanding problems in our Universe. For example, OKC researchers use Type Ia supernovae as standard candles with which to measure the expansion of the Universe. With gravitational wave observatories turning on, OKC scientists are working to predict and observe the electromagnetic signatures associated with the events which produce this type of radiation, including merging black holes and neutron stars. Theoretical work at the OKC underpins the extensive observational programs to detect these sources and seeks to understand them in the context of different theories of gravity. What is the correct theory of gravity? Alternative theories of gravity are motivated by the desire to better describe the observationally-driven concepts of inflation, dark matter, and dark energy in our Universe. Theoretical researchers at the OKC, working closely with theorists at NORDITA, are actively investigating and developing alternative gravity theories, including bimetric gravity and higher spin gravity. OKC scientists are actively involved in a wide variety of national and international collaborations, experiments, and observatories. Visiting scientists from all over the world are hosted at the OKC for collaborative purposes. Researchers and students at the Centre enjoy a large palette of supporting activities like weekly OKC Colloquia, biweekly Working Group meetings, OKC-day gatherings every term, and monthly cross-disciplinary science pubs. The OKC carries out a number of outreach activities in order to share our excitement about science with the public.